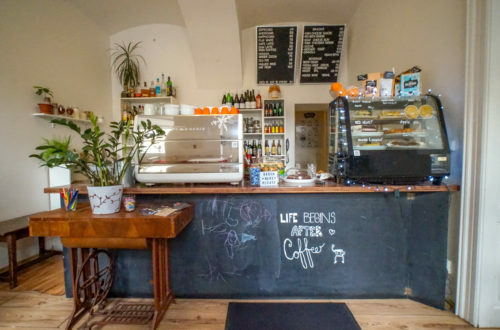 For some exciting places, you need to get out of the city center. 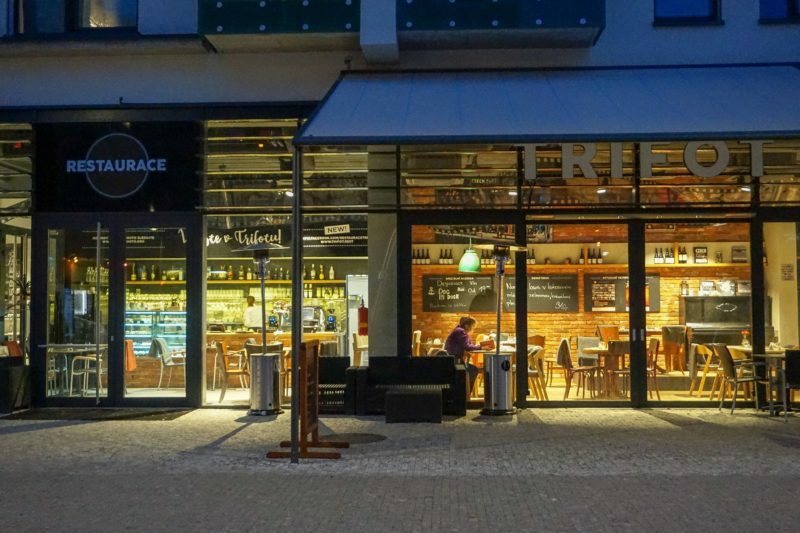 Discover this multi-genre artistic venue nearby metro Nové Butovice. 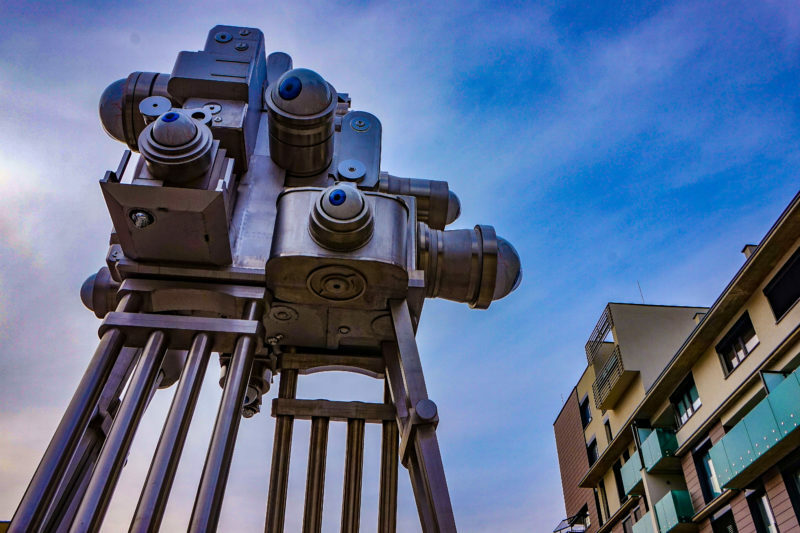 You will find a 12-meter tall Trifot that is closely watching the surrounding like a Big Brother. 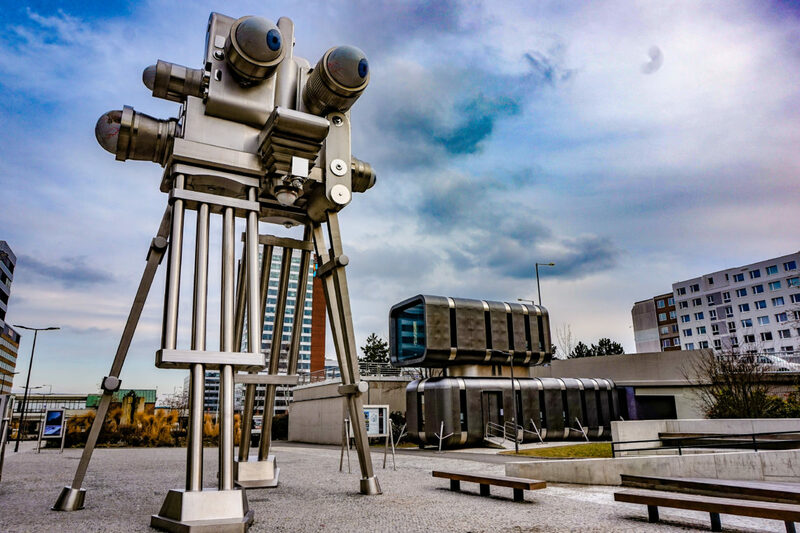 Spent some time with this creature, take a coffee in nearby Trifot restaurant and explore the latest exhibition of the Czech Photo Centre. 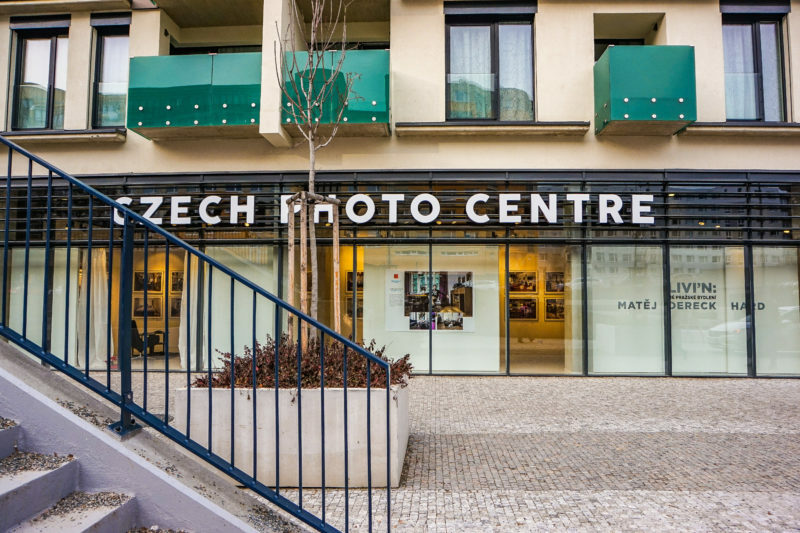 In this photo gallery, you will always find interesting exhibitions of Czech and foreign photographers. Recently, I admired an exhibition of young artist Matěj Dereck Hard photographing Czech celebrities in their homes. If you are interested in photography, check the program of public lectures and workshops. 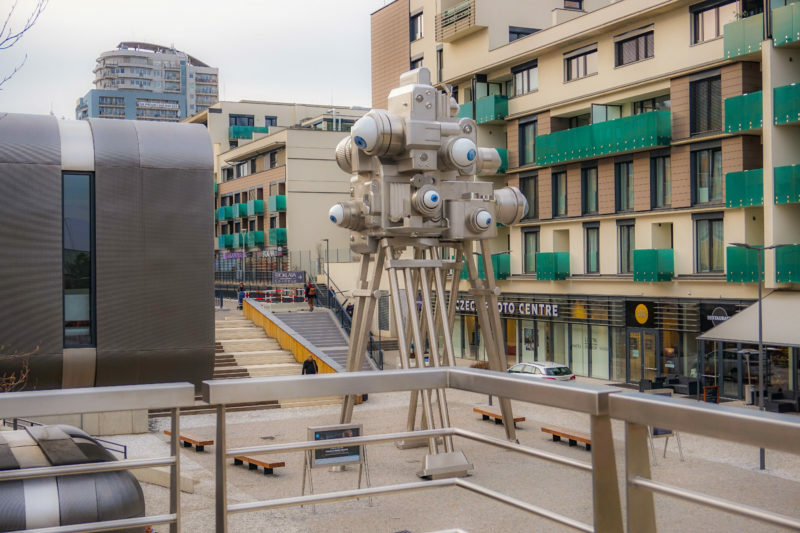 The centre is even using the outside area around Trifot for street art installations. 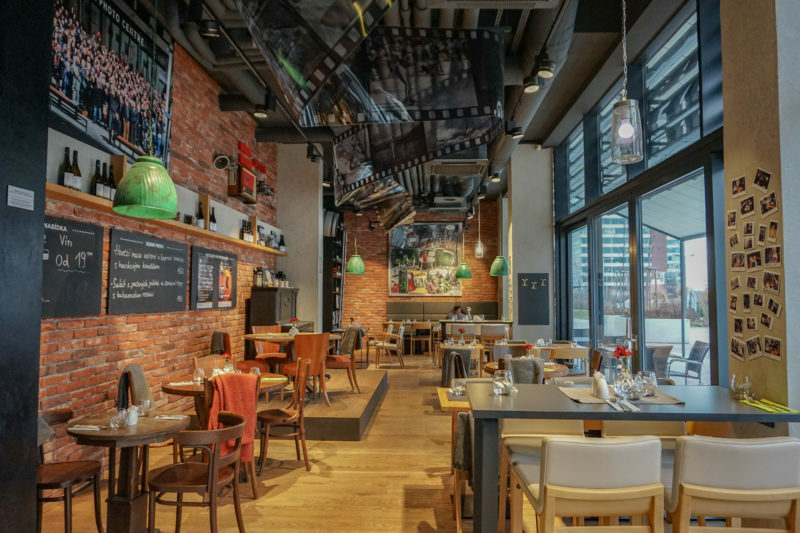 The restaurant has several interesting aspects that connect art and gastronomy. 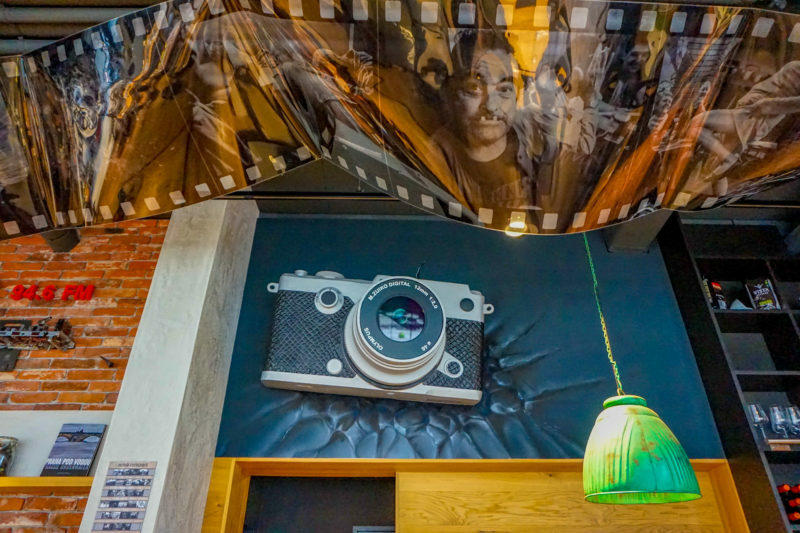 Interior is designed in an urban design style that features photography art. Alongside the whole ceiling, you find retro photographic film. What attracted my curiosity is a bookshelf with numerous books about photography. 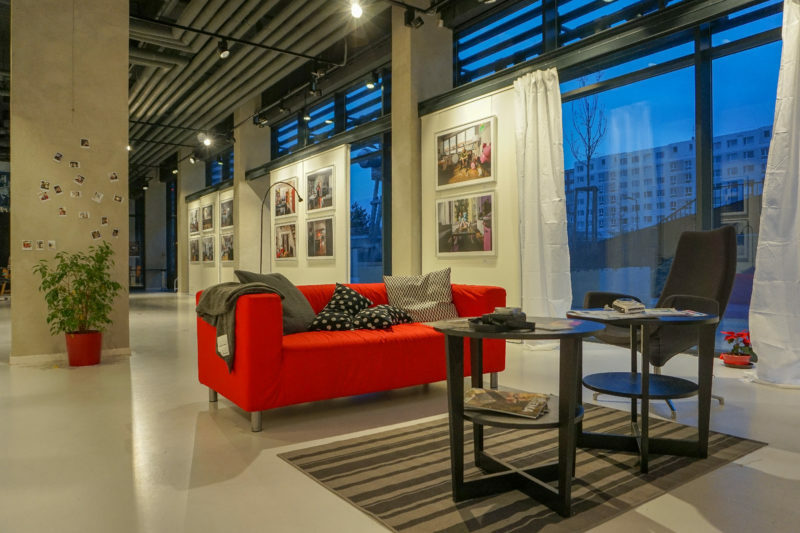 For photography lovers, it is just an ideal place to grab a coffee and immerse yourself in the photography world. I give this restaurant an extra star for a piano and occasional live performances. Check the actual program of Trifot Restaurant. 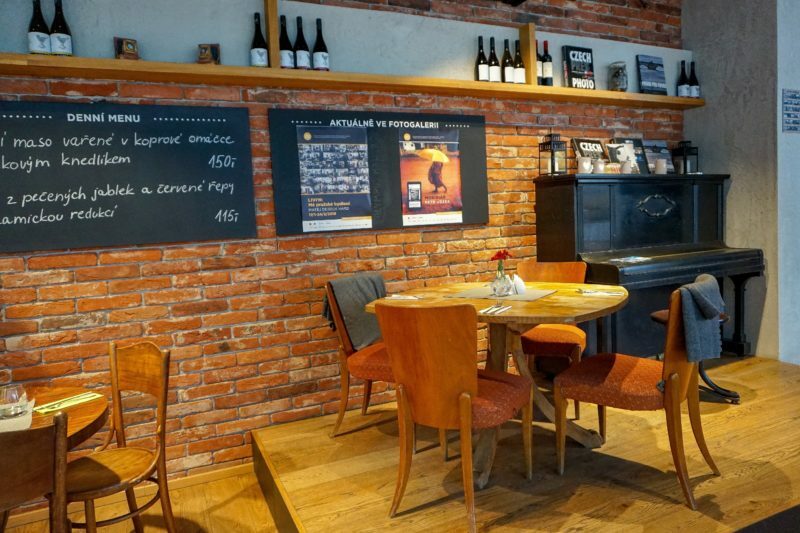 The restaurant has something special to offer also for food and wine lovers. Food is prepared only from fresh ingredients. Frozen food and ready-to-cook meals are taboo here. In the daily menu, you will always find a fish. I tried salmon with coconut milk, vegetables, and cauliflower patties and I must admit I was completely satisfied. 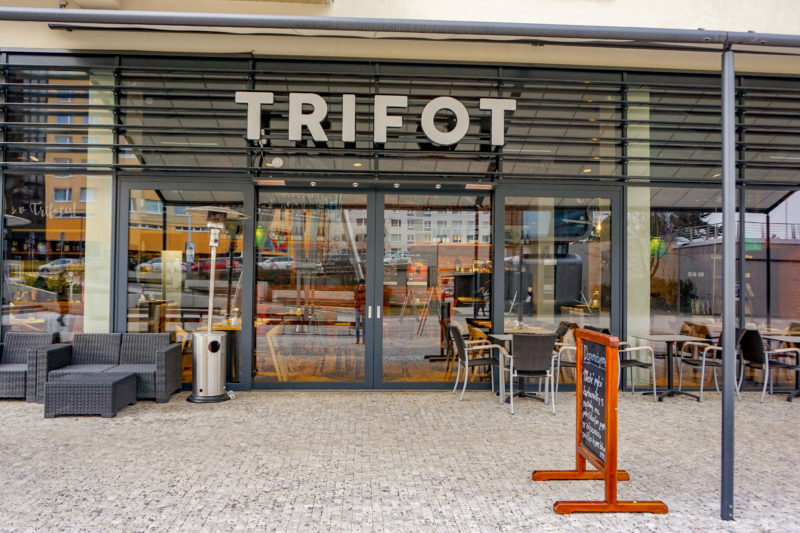 If you want to discover new wines, Trifot restaurant has a stock of Dog in Dock wines and, also provides degustation of seven samples for 290 CZK. 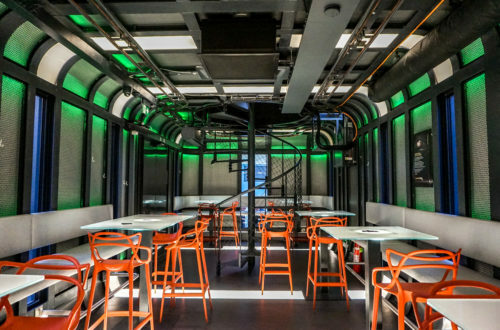 The restaurant has even an outdoor sitting area where you can watch Trifot and his tricks with passers-by. 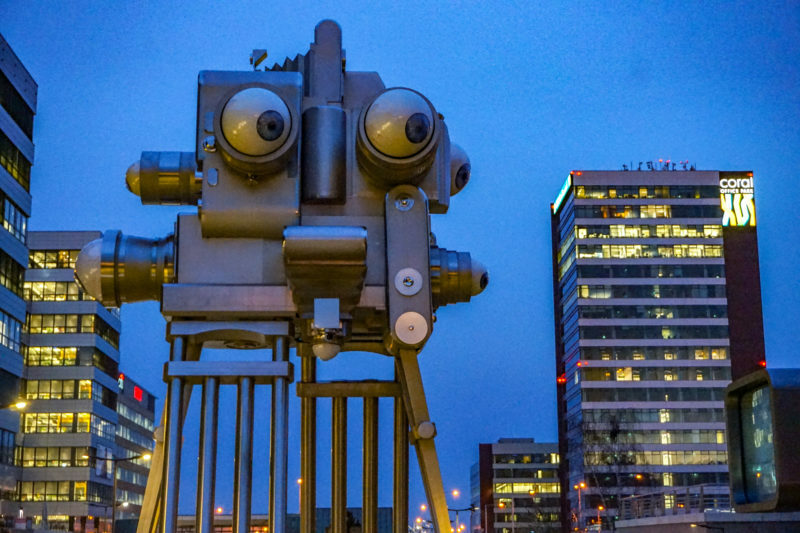 Trifot is 12 meters tall creature that stands on the tripod legs. The head is created from different kind of cameras that were popular over the last few decades. 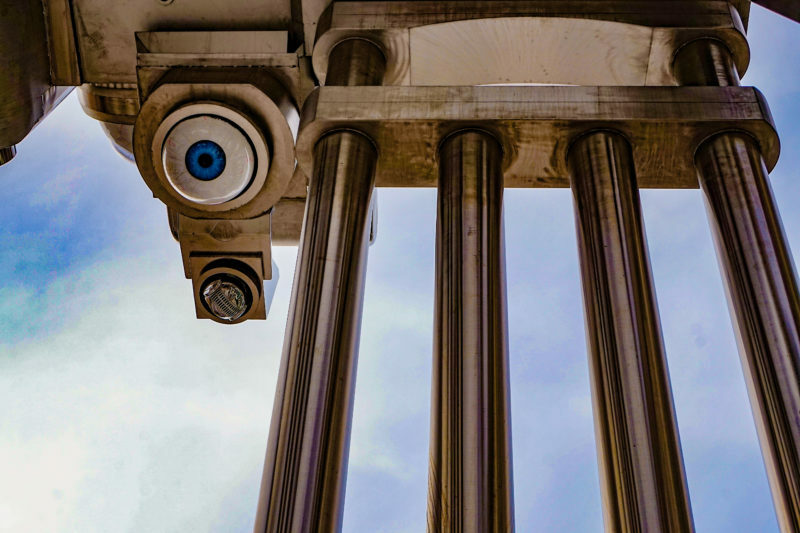 Trifot has several eyes around its head that are closely watching pedestrians walking by and display them on four large screens. Don’t worry, the records of people disappear immediately and are not stored anywhere. It symbolizes “Big Brother” in a slightly different sense that famous book 1984 of George Orwell. Today, everybody has a camera in the phones and can capture almost everything and everybody on this planet, regardless of the consent of the people on the picture. 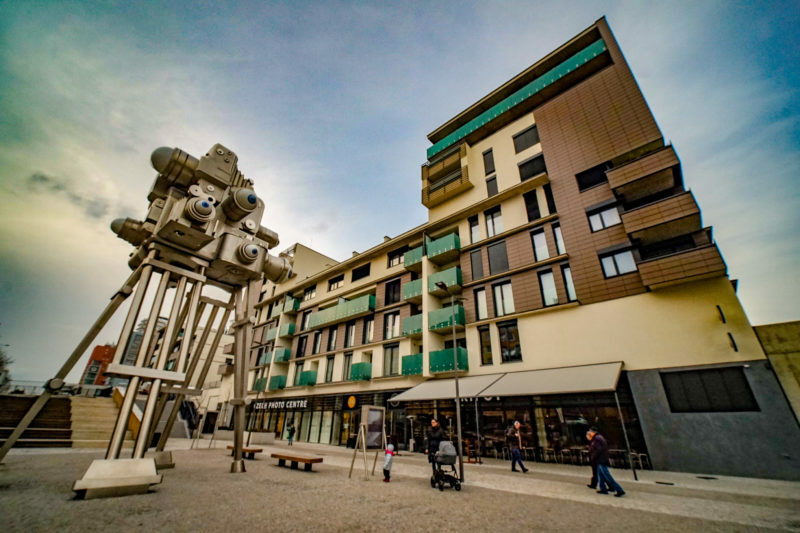 David Černý is well known in the Czech Republic for his controversial installations. 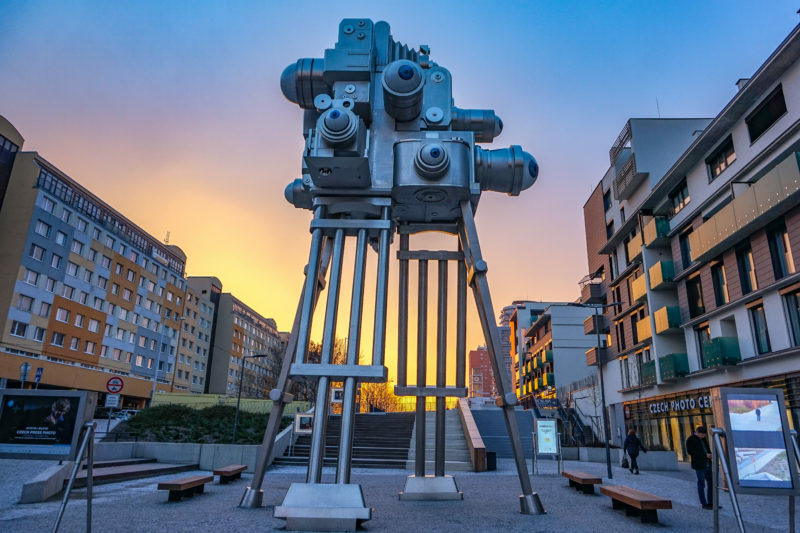 You might know the statue of a horse in Lucerna, giant babies in Kampa and on the Žižkov tower, two men peeing on the Czech Republic, huge moving head of Franz Kafka by Quadrio shopping mall and many more. He became particularly known during the presidency of the Czech Republic in EU in 2009. 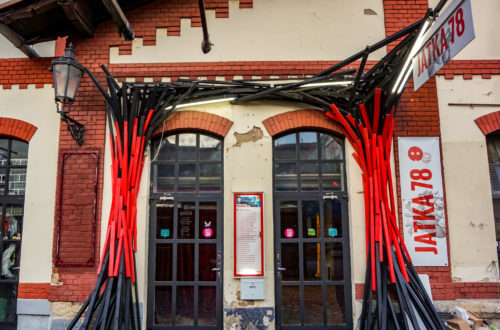 His installation Entropa portrayed stereotypes about European cultures in quite a controversial way. In newly open Cyberdog interior (just next to the Trifot), you can explore one of the latest contributions of David Černý to modern art. The easiest way is to take a yellow line of metro until Nové Butovice. Find a pedestrian avenue leading under the highway and walk until you see Trifot from a distance.